How can you protect people and inventory from falling loads and components? How do items fall from conveyors? Typically, a conveyor system runs at pre-planned speeds compatible with its designed load size and weight. However, if there are system issues and conveyed products back up or jams, loads have the potential to tip up, tumble, or fall. Rollers can also blow out if there is a mechanical issue with the conveyor. This can drop steel rollers or other mechanical components to the floor. Even full belts have fallen in extreme conditions. If loads that the system is not designed to carry are placed on the conveyor, this can also result in a fall. Systems that operate at very high speed also may cause products to fall. Conveyor falls and jams also have a safety issue beyond items hitting workers on the floor. If there is a jam or other issue, this requires a worker to climb or be elevated to fix the system, which creates another risk in and of itself. What are some methods you can use to reduce falling items from your conveyor lines? OSHA 1926.555 (a) (5) states that: “Where a conveyor passes over work areas, aisles, or thoroughfares, suitable conveyor guards shall be provided to protect employees required to work below the conveyors.” That’s the reality. You have to guard conveyors over a work aisle, but you also need to consider it in other areas where safety isn’t the concern and product protection is. What are some steps you can take to reduce these risks? Troughs help keep loads contained on the conveyor belt and prevent them from falling. Guardrail is built onto the frame forming to keep loads on track, creating the “trough” for handling loose parts or other loads that require guard railings. Seen above in a package handling operation with takeaway to a trash line. In some situations, bulk parts can be conveyed and protected with this method. Excellent for incline/decline, straight line operations. These can be specified in a range of sizes and angles. Conveyors such as the Hytrol model TR “trough” belt conveyor come standard with trough designs that can help contain a variety of items. For bulkier items, see trash conveyor systems. 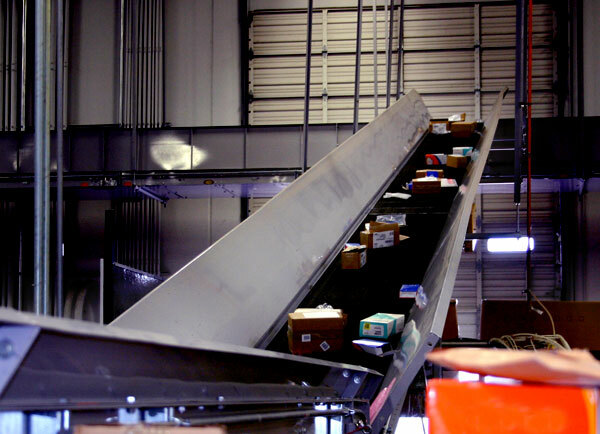 For conveyors with packages, totes and other small loads, integrated guard railing provides protection against product spills. 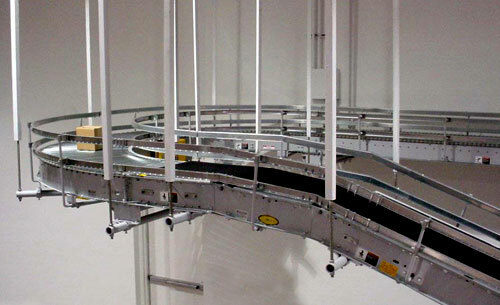 Ideal for curves, as these rails can track exactly to the shape of the conveyor as it moves through a facility. For carton loads, they offer excellent protection. 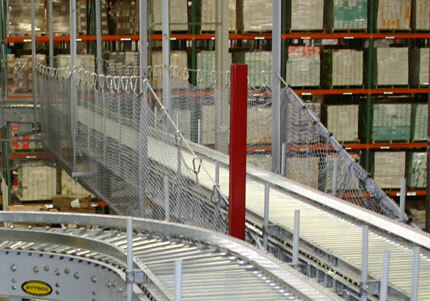 In operations where conveyors pass overhead, it’s not unusual to see conveyors guarded by both side mounted guard railing and conveyor system safety nets, to provide redundant safety. These systems help prevent falls that standard conveyor guardrails can’t, (falling conveyor components or large cartons that escape the limited reach of fixed guardrails). Nets will even catch a conveyor roller if one happens to fall. 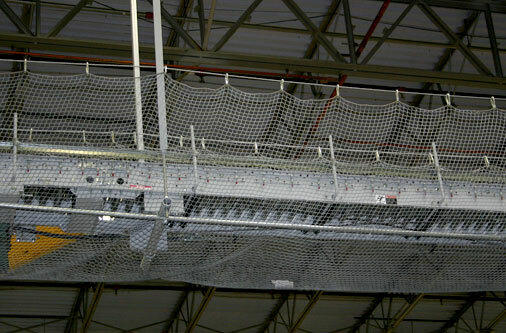 Nets can also be specified with a fine weave that catches smaller falling parts, hardware, etc. They provide flexibility in dealing with falling items that isn’t necessarily present in guardrail based solutions.